It’s really wonderful to plant historic heirloom varieties around homes, botanical gardens and parks of similar age. We are also intent on preserving plant diversity as much as possible. The varieties of heirloom flower bulbs included in this listing are all dated in the 1950s or earlier and are grown commercially in the Netherlands and considered to be horticulturally viable. 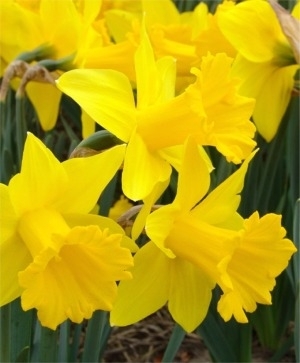 Commonly, Narcissi are referred to as Daffodils or as Jonquils, reflecting the types of Narcissi historically grown on a regional basis over time. Daffodils, or Narcissi, belong to the horticultural genus Narcissus, which is broken down into 13 divisions by the Royal Horticultural Society, the International Registration Authority for all cultivars. (Please note that we have paraphrased the definitions.) 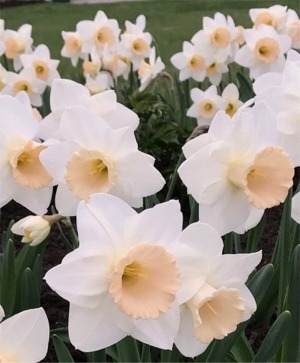 For more information, one may consult the Royal Horticultural Society’s International Daffodil Register and Classified List). One flower per stem. The corona or trumpet is as long as or longer than the perianth segments (flower petals). One flower per stem. The corona or cup is at least one third as long as but not as long as the perianth segments (flower petals). One flower per stem. The corona or cup is less than one third the length of the perianth segments (flower petals). One or more flowers per stem with a doubling of the perianth segments (flower petals) or corona (cup), or both. Two or more pendant flowers per stem. The perianth segments (flower petals) are usually reflexed (arched back) to varying degrees. One flower per stem. The perianth segments (flower petals) are significantly reflexed (arched back) and the flower is at an acute angle to the stem with a short pedicel (neck). One to five flowers per stem. The perianth segments (flower petals) are spreading or reflexed (arched back). The corona is shorter and shaped like a cup or a funnel. The flowers are usually fragrant. Three to 20 flowers on a stout stem. The perianth segments (flower petals) are spreading. The flowers are usually fragrant. One flower per stem. The perianth segments (flower petals) are usually white. The corona is very short or disc-shaped, usually with a green and/or yellow center and a red rim. The flowers are usually fragrant. One flower per stem. The perianth segments (flower petals) are insignificant compared to the dominant corona (cup). The corona or cup is split for more than half of its length. 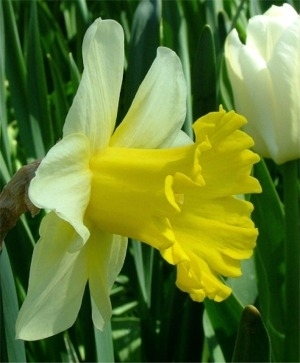 There are two types of Split Corona Narcissi. Collar Types: The corona or cup segments are usually in two layers (whorls) of three segments that can almost cover the flower petals. Papillon (Butterfly) Types: The corona or cup is split into two layers sandwiched in between two layers of flower petals, or over one layer of six flower petals. This division includes cultivars that do not fall into other divisions. One should select healthy, top-size Narcissus bulbs based on their individual hardiness for the horticultural zone of the planting site. 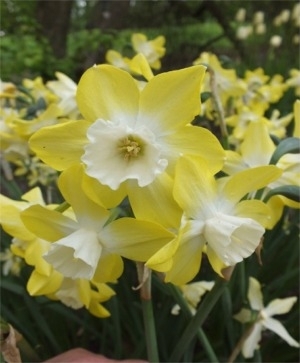 Generally, Trumpet Daffodils and Large Cupped, Pink Large Cupped, Small Cupped, Double, Poeticus and Cyclamineus Narcissi are all good for colder areas, from horticultural zones 3 through 7. Small Cupped, Double and Cyclamineus Narcissi are also suitable for planting sites through horticultural zone 8. Miniature Trumpet Daffodils and Split Cup Narcissi are hardy from horticultural zones 4 through 8, while Triandrus Narcissi are good for zones 4 through 9. Tazetta and Jonquilla Narcissi are best for moderate and warmer areas from horticultural zones 5 through 9. 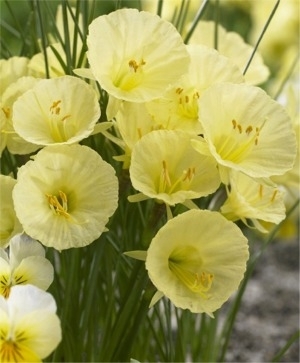 We normally recommend selecting larger and taller Narcissus varieties for planting sites enjoyed from a distance. Smaller, more diminutive varieties, are good for spots that can be enjoyed intimately, like along a well-traveled path to one’s home, naturally clustered along a prominent stone wall, in a rock garden or in a spot clearly visible from windows. It is wise to consider where they will best be enjoyed during their bloom time. We prefer to plant Narcissi for a more natural look; en masse in clusters or swaths of individual varieties in gardens beds among shrubbery and perennials, rather than in straight lines like soldiers. Naturalizing Narcissus Mixtures are perfect for plantings enjoyed from a distance and for woodland drifts. Most of our Naturalizing Narcissus Mixtures offer the benefit of early, mid and late varieties for prolonged bloom times. Others offer an explosion of blooms at one time, like our Double Narcissus Mixtures and our Sparkling Spring Narcissus Mixtures. In days gone by, natural Narcissus plantings may have been randomly designed by actually throwing the bulbs around to avoid any linear or geometric pattern. We don’t think that is necessary, since it is followed by a bulb-hide-and-seek planting process, but it is nice to space them around with little discernible pattern. The square footage of a planting site is determined by multiplying the width by the length. For example, a bed that is 5' wide and 20' long would be 100 square feet for which one would need 400 Narcissus bulbs (or up to 900 small Narcissus bulbs). If there is other plant material in the planting site, you can estimate the space involved and decrease the square footage proportionately. No matter how well we ourselves estimate the number of bulbs required for a particular planting site, we always manage to run out and need more. If this happens to you, too, just call us and we will ship more out to you as soon as humanly possible: usually the same day, if you call by noon. All Narcissus bulbs should be planted in the fall once the soil has cooled down to 60°F to 55°F (after two weeks of sweater weather), normally just before or slightly after a killing frost. 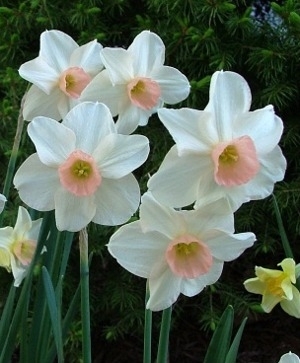 Narcissus bulbs do everything in response to soil and ambient air temperature and sunlight. Planting Narcissus bulbs too early, before the ground has really cooled down, can cause the bulbs to begin top growth rather than root growth, resulting in immature root development and diminished vitality. Narcissus bulbs can benefit from being planted a bit earlier than Tulips and other bulbs. 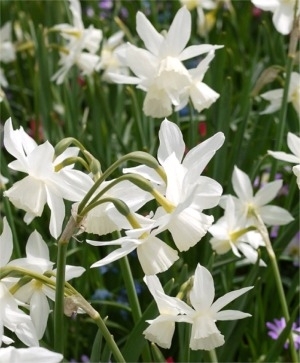 To plant Narcissus bulbs later in colder soil retards root growth and may result in reduced foliage production and few, if any, flowers in the spring. If you live in a colder zone, you may want to refer to our Flower Bulb Protection in Colder Areas section. If the planting site is in horticultural zone 8 or warmer, you may decide to precool your Narcissus bulbs to help them best develop a thorough, mature root system the first year. If you have any specific questions about precooling Narcissus bulbs, it is best to consult a local horticultural expert familiar with your microclimate. You may want to refer to our Precooling Flower Bulbs section. We will ship your order to you so that you may plant your Narcissus bulbs at the proper time for your horticultural zone. You may want to refer to our Order Shipment, Order Inspection and Flower Bulb Storage sections. 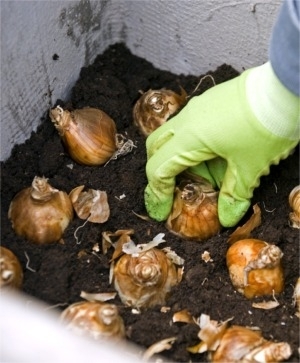 Prior to planting, open all exterior and interior boxes and inspect your Narcissus bulbs. Discard any that are not firm. The papery sheath surrounding the narcissus bulb may or may not be intact: it has no bearing on the vitality or performance of the bulb. 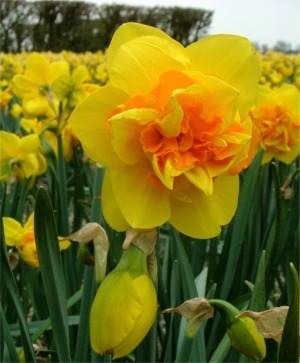 Each Narcissus variety produces its own annual top size bulb that can range from 6 centimeters in circumference, in the case of Species Miniature Narcissus jonquilla simplex, to 15/17 centimeters in circumference, in the case of Trumpet Daffodil Marieke. (A measurement of circumference is taken by measuring around the widest girth of the bulb, as if one were measuring one’s waist: not a straight line measurement from left to right.) 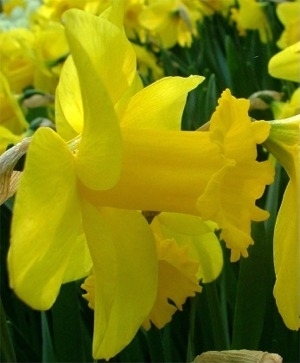 Individual Narcissus varieties may have different bulb shapes too. Many varieties may have attached to the "mother" bulb a baby bulb or two, known as bulblets or offshoots. They need not be broken off from the mother bulb prior to planting. If they break off, plant them at the same depth and space apart as the mother bulb. In any one package of Narcissus bulbs, you might find some different sizes. Rest assured that the smallest of them is at least the size specified for that variety: the others are larger than the size specified: kind of like a bulb bonus. With few exceptions, all flower bulbs require the same sort of planting site: well-draining, neutral pH soil that is free of disease with at least six hours of daily sunlight. Since Narcissi are rarely, if ever, snack food for deer or marauding rodents, wildlife avoidance need not be a consideration. You may want to refer to our Soil Good for Flower Bulbs section for more information. If Narcissus bulbs are planted along a road or driveway, they should be away from any plowed snow accumulation that may include road salt or other de-icing compounds, which are harmful to bulbs. Narcissus bulbs should be planted away from aggressive tree and perennial plant root systems that can strangle bulb root systems, compete for limited water and nutrition, and actually push bulbs up from the proper planting depth. Narcissus bulbs hate to get "wet feet". They should never be planted in areas with poor, excessive or continuous water drainage, or standing water. Moisture-ridden soil causes a healthy bulb to rot. If planted near a body of water, bulbs must be planted well above the high water mark. If planting along a stone wall, make sure that water drainage is away from the Narcissus planting. Narcissi planted on hills or slopes often sustain water damage as water drains and settles in pockets (planting holes). Do not plant new Narcissus bulbs in previously diseased soil or in areas containing previously planted, diseased Narcissus bulbs. Healthy flower bulbs can be infected by existing soil-borne diseases that can cause stunted, yellowed foliage, no flowers and eventually rot. Never use top dressings of mint compost, horse manure, chicken droppings, mushroom compost, other "hot" manure, garden compost, household compost or commercial soil amendments for Narcissus flower bulb planting holes or beds. They are not usually neutral pH. These top dressings or soil additives may create acidic or alkaline pH levels that prevent or retard root growth, and can actually rot the bulbs themselves. Garden and household composts often fail to decompose fully due to insufficient heat generation, and can be a breeding ground for damaging fungus and weeds. Check the planting instructions and plant each bulb to at least the proper spacing and proper depth. 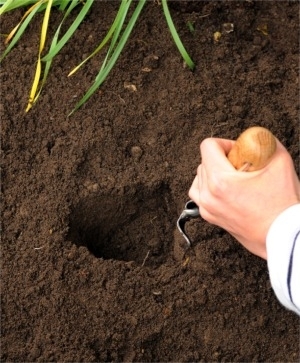 It is a good idea to dig 2" to 3" below the planting depth to loosen the soil to promote thorough root growth. The planting depth and spacing is so very important for the long term health and vitality of Narcissus plantings. Most Narcissus bulbs must be planted at least 6" to 8" deep, and 6" apart from each other so that their own root systems do not strangle each other or compete for water and nutrients. As the original 'mother' bulbs grow, they develop baby bulbs on their sides, commonly known as bulblets or offshoots. The little bulblets grow, and eventually break off of the mother bulb. Over time, they continue to grow, sending up foliage at first, and then flowers, as they mature. Narcissus bulbs naturalize by thickening underground. This is why it is so important to plant Narcissus bulbs the proper spacing apart. At a certain point in time, a Narcissus planting may become so dense, with root systems so entwined, that they will start to yield more foliage than flowers. Whenever this happens, it means that there is a problem with the root system. In this case, it means that the bulbs need to be dug up, gently separated with as little root destruction as possible, and replanted to the proper depth and original spacing. 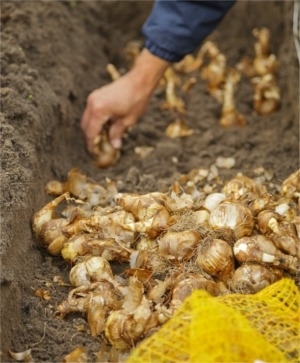 The best time to transplant Narcissus bulbs is in the fall, at the normal planting time. In the spring, mark the area and photograph it to make fall transplanting easier. Other reasons for foliage-only and few if any flowers are acidic or alkaline soil, insufficient cold temperatures over the winter, temperature spiking over the winter, shallow planting or prior spring foliage that was prematurely cut, braided or covered by other plant material. If a Narcissus planting doesn't even yield foliage, it usually indicates poor water drainage, excessively acidic or alkaline soil or diseased soil. It is also essential to plant Narcissus bulbs as deep as instructed, normally 6" to 8" deep (with the exception of some of the smaller bulbs). 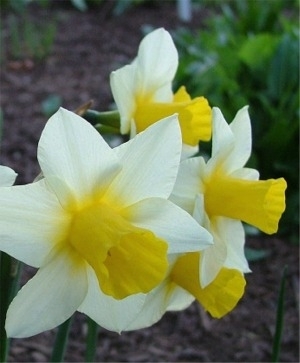 Narcissus bulbs planted too shallow can suffer from temperature spiking in both colder and warmer climates, which in turn can cause root system damage, poor flower production and poor long-term viability. Narcissi planted too shallow can also split into smaller, nonproductive bulbs. Place each bulb firmly in the soil with the pointed end up, and the basal plate, or root base, down. The general rule of thumb is to cover the top of each Narcissus bulb with 3" to 4" of soil, taking care to not break off any sprout growth. The existence or amount of top growth varies by variety. Never put anything in the bottom of a planting hole. This is the best way to avoid the possibility of root burn. The truth is that the Narcissus bulbs you receive from us are perfect little packages that contain everything they need for glorious blooms the following spring following the development of mature root systems. But it doesn't hurt to start fertilizing three times a year after you plant them. 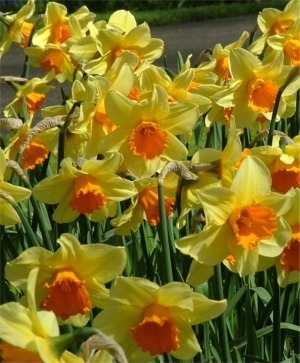 Top dress Narcissus plantings with a 4-10-6 organic granular fertilizer three times a year. This means to broadcast the fertilizer like one would birdseed, at the rate of about one teaspoon per bulb. First, top dress fertilize in the fall to promote root growth. Second, fertilize in the spring when the sprouts emerge to help grow the foliage and flower, and third, fertilize when the flower starts to die back to help nourish the bulb itself. If there is a prolonged dry period after fertilizing, you may water it in lightly. Bone meal is not recommended because it can attract animals and it is incomplete nutritionally. (The 4-10-6 fertilizer composition refers to 4 parts nitrogen, 10 parts phosphorus and 6 parts potassium.) Avoid root burn by never adding anything to a planting hole. One should apply no more than a 2" layer of mulch only after the surface of the ground freezes. 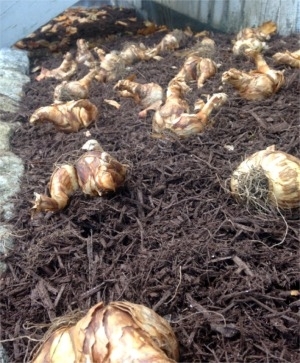 The mulch is intended to trap the cold in the soil (not warmth), retain moderate soil moisture and protect the bulbs from temperature spiking. Some good mulching mediums include straw, salt marsh hay or oak leaves. The mulch should be loosened or removed prior to sprout emergence in the spring. Narcissus bulbs should never be planted in outdoor containers, window boxes or raised beds where bulbs experience temperature spiking and repeat cycles of freezing and thawing. This results in root growth failure, root system destruction, frozen bulbs and/or bulb rot from poor water drainage. Narcissus bulbs must have a consistent cold winter temperature with good water drainage in order to produce a mature root system that will permit foliage growth and flower production in the spring. The bloom time listed for each variety is for horticultural zone 5 in 'normal' spring conditions. 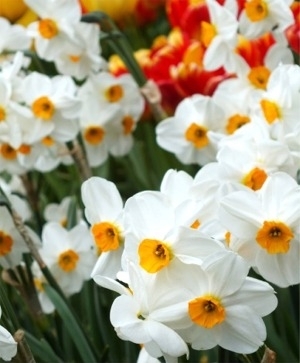 The warmer the horticultural zone, the earlier Narcissi will bloom in the spring. The colder the horticultural zone, the later Narcissi will bloom in the spring. Flower bulbs do everything in response to temperature, sunlight and site conditions. Bloom times, heights and colors are approximations affected by temperature and site conditions regardless of the calendar date. If it is a warm spring, bulbs will bloom earlier. If it is a cold spring, bulbs will bloom later. If it is a long cool spring, followed by rapid warming, you may find odd bedfellows: earlier blooming Narcissi flowering right along side later blooming varieties. Each spring can offer a different sort of garden surprise party. In the event of a mild winter or a warmer-than-usual spring, Narcissi that have emergent stalks with set buds may bloom early, small and short, although they will likely grow taller and larger as long as temperatures moderate. Temperature spikes can also affect mature root development, the actual form of the flower or the process of flower color maturation. 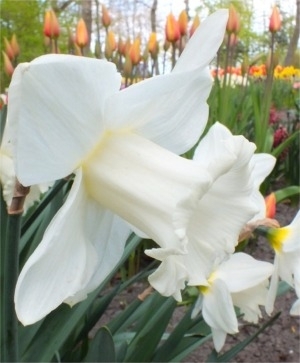 An example would be Large Cupped Narcissus Fragrant Breeze. In normal or warm temperatures, the flower has a flattened cup, whereas in a cooler spring, the cup would be more bowl-shaped. Generally, cooler weather inhibits fragrance, whereas warmer weather incites fragrance. 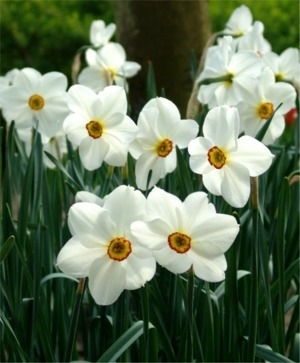 New Narcissus bulb plantings can bloom as much as two weeks later than established, mature plantings. Over time, they will catch up. Before the Narcissus sprouts emerge, loosen or remove any mulch, and as the sprouts first poke through the soil, broadcast a light top dressing of a granular, organic 4-10-6 fertilizer on top of the soil. This will help to grow the foliage and flowers. You may lightly water it in if rain is not forecast. Enjoy every moment of Narcissus blooms in the spring, for it will be a whole year before you can luxuriate in their beauty and spirit again. When the flowers start to die back, broadcast another light top dressing of a granular, organic 4-10-6 fertilizer to help grow the bulb itself. After the flowers die, dead-head them an inch or two under the flower, if possible, to avoid the development of an unnecessary seed pod in the neck of the stem. Allow the stem and foliage to thrive unfettered for six to eight weeks, until they die back naturally for maximum photosynthesis and chlorophyll production that nourishes the bulb. Do not braid foliage, have other plant material grow to cover the foliage or allow it to be mowed down prematurely. Insufficient photosynthesis results in malnourished bulbs that will fail to thrive. Once the foliage has yellowed- or browned-out, it is dead. Then, it may be raked up and discarded. The bulbs are best left in the ground to regenerate. If you intend to cut Narcissi for bouquets, you should plant a separate cutting garden, rather than cutting your display Narcissi. If you do cut from your display beds, do so sparingly without decimating any one cluster or drift. 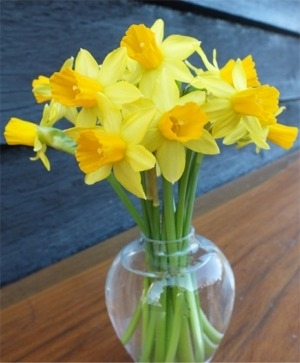 Cutting Narcissus stems can impact the vitality of the bulb for subsequent year blooms. Cut Narcissi stems should not be mixed with other cut flowers because their stems secrete a viscous substance that clogs up other stems and prevents water absorption. Even individual stems in bud vases are spectacular indoors. We like to fill fireplace mantels with all different sorts of bud vases and special varieties for close up inspection and enjoyment.